Alyson Software Solutions, was established in 1980 as a provider of high end software solutions. 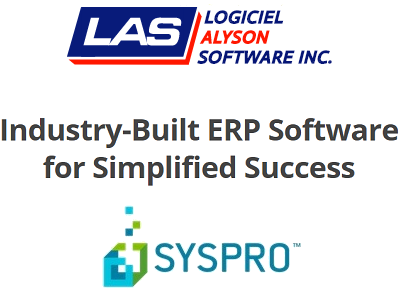 With offices in Toronto and Montreal, Alyson Software Solutions is the leading software solutions integrator for Syspro Systems, a world class and world wide software solution and the premiere Canadian ERP software as chosen by CA magazine. Alyson Software Solutions has been a Syspro reseller since 1999 and proudly boasts a clientele of leading manufacturers, importers and distributors, as well as not for profit organizations. All companies that take a keen interest in managing inventory and costs. The principals of Alyson Software Solutions have an in-depth understanding and experience with owner managed businesses and specialize in using software to implement and improve business processes. At Alyson, our commitment and our only job is to make the software work for our clients and to maintain our reputation as a first class IT service provider. 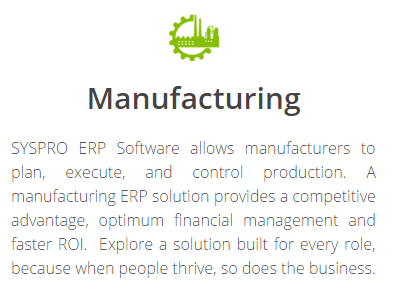 SYSPRO ERP software is a fully integrated business solution that gives firms in a variety of industries complete control over the planning and management of all facets of their operations, including accounting, manufacturing and distribution. With access to easy-to-view, real-time information, a business can leverage SYSPRO software to respond rapidly to changing circumstances, react quickly to customer demands, reduce operating costs through streamlined processes and workflow automation and outpace the competition. Because the SYSPRO ERP system can extend the enterprise with sophisticated CRM, APS and e-commerce functionality, a company can easily extend control to its entire supply chain. The power of SYSPRO software is further enhanced via 3-tier client/server setup and SYSPRO e.net solutions, component-based framework that provides a standard way of directly accessing the business functionality within the SYSPRO solution while maintaining the software's built-in business rules and security. In addition to enabling Web services, SYSPRO e.net solutions also facilitates the integration of other best-of-breed applications with SYSPRO software. The modular nature of the SYSPRO ERP solution allows a firm to select those functions needed to increase operational control and effectiveness. 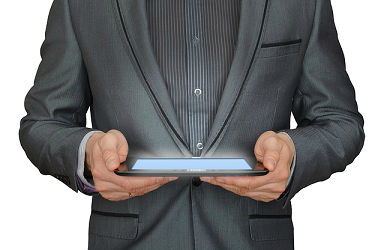 SYSPRO software is enhanced and upgraded on an ongoing basis. The software is available in multiple languages and supports the euro. With a foundation of leading-edge technology, SYSPRO software enables a business to reap the rewards of a more efficient operation. SYSPRO's financial modules are equally suited to emerging as well as complex and sophisticated corporate financial accounting. With SYSPRO financial modules, you have the freedom to manage and control operational constraints at the individual level, while providing group information for budgeting, turnover and profitability assessment. The financial modules are integrated with the distribution and manufacturing applications, making SYSPRO one of the few completely integrated product offerings on the market. SYSPRO provides wholesalers and distributors with an enterprise-wide business solution to maximize control over operations and inventory and better service customers. It's ideal for operations that need quick order entry procedures, visibility of operation from the order entry screen, and extensive lot and serial tracking capabilities. 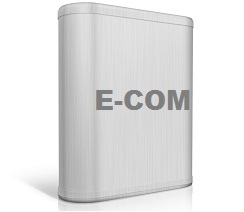 In addition to extensive shipping and multi-warehousing management capabilities. SYSPRO is well suited to single and multi-site domestic and international distributors. It features blanket sales order release management along with real time product configuration. It also helps to maximise purchasing control and ensure quality via a requisition-to-purchase order feature and two-step inspection of inventory processes. The software tracks shipments, customer returns and all costs involved in landing materials into the warehouse. Importers appreciate this ability as well as the accommodation of numerous forms of taxation (i.e. VAT, GST etc.) and foreign currency controls. 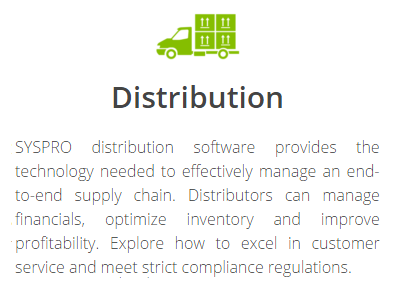 SYSPRO offers an array of those features most sought by wholesalers and distributors. These include the ability to handle multiple pricing and discount levels, comprehensive sales history reporting, as well as support for fractional pricing and choice of inventory control methods. In addition, inventory tracking is greatly facilitated through Web-based ordering and the software's ability to accommodate bar code readers. Since SYSPRO is a real time, integrated system, all information regarding purchase orders, sales orders, credit. SYSPRO's outstanding flexibility accommodates a wide range of production methods. It enables discrete, batch process and custom manufacturers to achieve competitive advantages in a dynamic marketplace. SYSPRO's manufacturing modules offer an array of features for estimating, master scheduling, finite capacity scheduling, labor performance, costing, lot and serial tracking, purchasing/receiving, backflushing, material verification, capacity and material requirements planning. SYSPRO addresses all aspects of the manufacturing process. This functionality provides the ability to synchronize and integrate a variety of manufacturing techniques all within one fully integrated software system. SYSPRO provides all the facilities to control both short and long product runs. However, since the batch size of a particular product can vary from a few units to several thousand units, SYSPRO will calculate the dynamic elapsed time of an operation or job. Environments include assemble-to-order, blend-to-order and finish-to-order through to the genuine job shop. SYSPRO offers many advanced features for the discrete manufacturer. The continuous flow of production is controlled through the scheduling of material and capacity requirements. 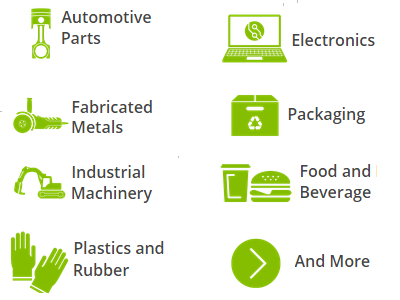 For make-to-stock environments, SYSPRO tracks finished goods, components and raw materials. Optionally, kit issues provide efficient relieving of component inventory. Emphasis is placed on scrap control, milestone operations and up-to-date dispatch lists. Serial number tracking is supported. Well suited for bulk commodities, which are often packaged to order, SYSPRO allows for a continuous flow of operations. SYSPRO manages production expressed as units per time period, with consideration given to the clean out and/or tear down of equipment between runs. Optionally, backflushing and superflushing of finished products can be used to relieve raw materials from inventory. Full lot and serial traceability is provided to satisfy statutory requirements, where needed. For years manufacturers have been trying to tame the shop floor. The biggest hurdle is the state of flux and unpredictability in a real-time manufacturing environment. Scheduling, data capture, monitoring and quality tools are widely available, yet the factory manager can never be certain of exerting total control over the process without having a complete, real-time picture of what's happening on the floor. SYSPRO APS is a software solution dedicated to the factory floor. It provides management with a comprehensive, real-time view of the shop floor in any dynamic manufacturing environment. SYSPRO APS provides a graphical image of the shop floor in real-time and measures productivity at the closest point to manufacture, as it happens - not after the event. 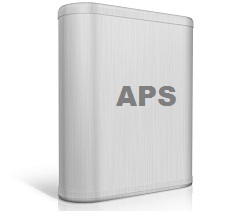 SYSPRO APS has been created as a set of integrated modules that may be tailored to a factory's individual requirements. Factory Planner assists users in planning workload against available capacity. Capacity is derived from the number of available machines and its working hours. Load is calculated using the standard structures and routes provided by our ERP system. Cell Scheduler allows each manufacturing cell to be scheduled independently with user-defined rules for optimizing and viewing work in the cell. Gantt charts show a time-based view of scheduled operations for the machines in each particular cell. Additional requirements for resources such as operators, setters and tools are shown in parallel with the Gantt chart when calculating the schedule. The Gantt chart is "live" and available for the "drag-and-drop" of jobs in time and between compatible machines. Should changes in demand or resources occur, they can be immediately reflected in the schedule. The schedules are in real-time with progress constantly reported from the shop floor so issues can be resolved immediately. Progress Tracker is a touch-screen compatible, graphical shop floor application that supplies operators with current work-to list. It also supplies a list of required materials and any text or diagrams associated with each job. The simple button-driven interface is simple to use. Jobs may be started, stopped, completed (wholly or in part), have scrap recorded and additional operators booked to them as necessary. The work-to list refreshes every few seconds to include new jobs or ones that have become available from upstream processes. SYSPRO APS integrates the recording of quality parameters with the recording of progress data. Quality data items to be recorded are user-defined and may be related to a machine, product, customer, or collected upon manual selection. The collected data is stored in a database that can be queried directly or via an analysis tool. SYSPRO APS provides instant checks for trends and "blips" in the collected data and can be configured to send warnings to other users when processes are getting out of the tolerance range. The SYSPRO comprehensive Customer Relationship Management (CRM) solution lets users track and manage all customer and supplier touch points. Customer correspondence, status, vendor relationships, marketing campaigns, service issues, product returns, warranty and repair histories, quote and sales order information are monitored and recorded, providing a 360 degree view of internal or external business relationships. SYSPRO CRM enables sales, marketing and customer support operations to work collaboratively to achieve total customer satisfaction. The SYSPRO sales force automation, marketing and service CRM applications are contained within a single, comprehensive module that gives a complete, in-depth view of the customer. Users can control all aspects of the customer management and sales cycle from a single screen, improving effectiveness and empowering employees with the tools to deliver effective and profitable products and service. Research shows that over 60% of CRM implementations fail due to the lack of integration with other systems, lack of user acceptance and the inability to quickly customize systems to match specific business requirements. What these points really tell us is that most CRM solutions do not offer the level of database integration that companies really need to gain superior insight and win competitive battles. SYSPRO CRM is an exception. It offers total integration with ERP modules, providing the wealth of real-time data that furthers customer visibility and service. 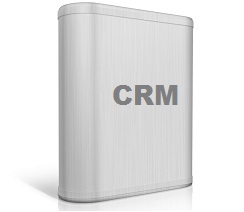 SYSPRO CRM also offers powerful account synchronication capabilities via replication on the laptop. This feature enhances the marketing, lead capture and field sales efforts to increase sales and profitability. The Internet is easily the most powerful business tool of the new millennium. It has altered business methodologies and dramatically impacted the ways organizations relate to their customers. From the ordering process to customer support and customer service, the Internet offers limitless opportunities to those companies who have the Web-enabling technologies to take advantage of them. The framework can be utilized to give authorized individuals the ability to interact with SYSPRO software data over the Web and from remote devices, including palm pilots and cell phones using WAP technology. It provides a structured way of directly accessing the business functionality within SYSPRO software while maintaining the software's built-in business rules and security. In addition to enabling important business functions such as remote purchase order entry and inventory status determination, SYSPRO e.net solutions also facilitates the integration of select best-of-breed applications with SYSPRO's enterprise solution. The ability to measure your business in today's highly competitive environment is invaluable. Companies must be able to access, analyze and measure sales, marketing campaigns, customer trends, production or any other key performance indicator (KPI) in order to make informed decisions that can influence revenue, profit, growth opportunity and productivity. Enterprise applications improve operational processes and contain valuable information but generally fail to present that data in a manner that helps users understand why things are happening. Enterprise applications need business intelligence (BI) to transform this information into knowledge that empowers users by providing the insight needed to monitor, analyze and plan accordingly. SYSPRO Analytics enables users to create multi-dimensional views of their financial and operational data to determine patterns and underlying trends, gauge performance, leverage opportunities and outmaneuver the competition. SYSPRO Analytics provides the decision maker with an easy to install, easy to configure and easy to use metric based application. The need to understand where the information comes from is eliminated by providing a series of intelligent analysis objects and metric templates that intuitively build the required processes for the information needed. This allows the decision maker to reach decisions promptly and not waste time trying to understand the intricacies of BI technology. If knowledge is power, SYSPRO Analytics makes every user a power center. Joe Kislowicz is a results-oriented business technology and computer systems professional. He has demonstrated leadership and the ability to be a team player in the programming, installation and implementation of enterprise-wide computer systems. His areas of particular expertise include forensic analysis and review, manufacturing and importing systems, financial systems, and municipality systems. He has successfully served clients in Canada, the United States and Europe. John is a seasoned professional with a strong reputation in the IT community. With over 25 years of experience John’s strengths are software development, system implementation and training. John had been a principle with Canada’s leading software firm. In 1998, John started Alyson Software and is today the leading authority on Syspro in Canada. John received his degree in computer Science from the University of New Brunswick. Jacques earned his CPA, CA with one of Canada’s leading audit firms, RSM Richter. (Richter, Usher, Vineberg). He followed public practice with a senior position in industry where he developed a strong interest in computer systems. Today he is Canada’s leading expert on Syspro accounting. His strong business background provides him with the knowhow to guide the most complex system implementations accounting for Syspro’s success.